The U.S. Small Business Administration (SBA) announced the winner of the 2015 Pennsylvania Small Business Person of the Year Award on Tuesday, March 31. The SBA has taken the opportunity to highlight the important role that entrepreneurs, small business owners, and many others from across the nation, play in our overall economy. Small businesses across Pennsylvania had the opportunity to nominate a person or business for one of several different categories. A group of officials selected a recipient from each category to be recognized and be awarded for their accomplishments. Joe Zidik, President and Owner of Custom Milling & Consulting, Inc., received Pennsylvania Small Business Person of Year Award for the state of Pennsylvania. Mr. Zidik was nominated by Martin Brill, Program Manager, International Trade, Kutztown University Small Business Development Center. CMC began as a small company that specialized in milling liquid based products for other companies, since 2002 they have expanded their services to include manufacturing a line of wet milling equipment, and produce their own line of premium mulch colorants. Currently their facility, located in Fleetwood PA, is comprised of four buildings that equal more than 70,000 square feet of space. In 2014 they opened CMC do Brasil, Ltda., a satellite contract processing facility in Curatiba, Brazil. They continue to explore new adventures and focus on innovation in every aspect of company. 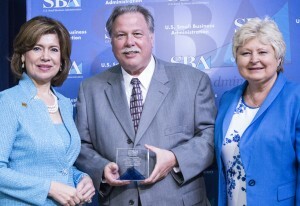 During the week of May 4-8, the SBA will visit the winners of the awards to tour the business and meet with the winners. On June 18th, the winners will be presented their award and recognized at a small ceremony in Philadelphia, PA.